What Deena Kastor Will Eat Before the New York City Marathon — and Her Goal! When you think of elite runners who inspire, it’s pretty impossible not to think of Deena Kastor. After all, she is basically a running legend. She claims the two fastest half-marathon performances by an American woman and the two fastest marathons by an American woman, plus she’s an Olympic medalist. She’ll be running the New York City Marathon this weekend, and we got the opportunity to pick her brain on a few things. 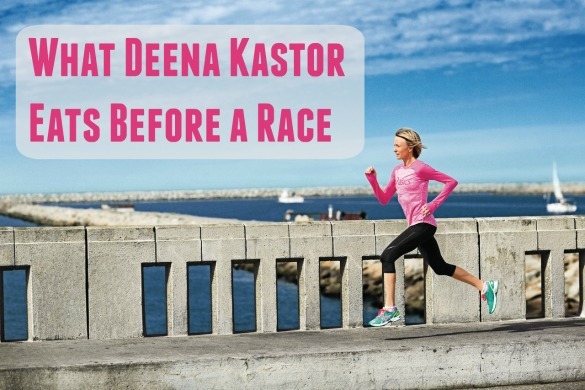 From her goal for the marathon to what inspires her, to what she eats before and after a race, here are our top six questions with THE woman, Deena Kastor! 1. What’s your goal for the New York City Marathon? My goal for New York is to get in the top five and run 2:25. The place is more of a benchmark, but 2:25 is the fitness I believe I am in to race New York this year. 2. What’s your favorite — and least favorite — part of the New York City Marathon course? My favorite part of the course is standing on the Verrazano-Narrows Bridge at the start line. The start line of New York is so electric and exciting. I also really love coming into Central Park. Central Park is so familiar, and I know the finish line is obtainable at that point. 3. What gear will you be wearing? New York can be slightly chilly, so I plan on wearing my ASICS uniform with the addition of arm warmers, headband to keep my ears warm and gloves. My favorite racing shoe is the ASICS GEL-Hyper Speed, which has a great color scheme this year! 4. Do you have a running mantra or a phrase you repeat to yourself when running? During the course of the marathon, I have to rely on a variety of inspiration. I jump around to reflecting on previous workouts, thinking of inspiring my daughter, taking in the noise of the crowds, having an obligation to represent the running community in the best way possible, taking a line from a poem or song that inspires me and also giving myself pressure to define who I am by pushing on. 5. What’s the best piece of advice you’ve ever received? My coach/husband, Andrew Kastor, believes that progress isn’t defined by a single workout or decision, but by weeks and years of hard work and good decision making. I like this thought process of running and life being about the accumulation of what we do on a daily basis. 6. What will you eat the night before, the morning of, and after the race? The night before a race I typically seek wood-fired pizza topped with some type of protein and vegetable or salmon and pesto pasta. I’m not super picky, but it can’t be too spicy (which I love otherwise), and I enjoy a combination of protein and carbs. The morning of the race I will typically have a couple pieces of toast and some eggs or oatmeal with nut butter blended in. After the race, since I drank sweet carbohydrate drinks all morning, I usually crave salty foods, a grass-fed burger or artisanal pizza.